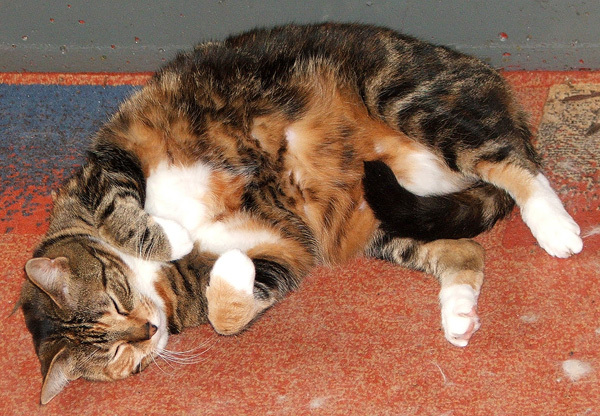 Cats inside the Moosey house get photographed a lot in winter - they are often more colourful than the garden outside! A bevy of cosy cat baskets with little woolly blankets are provided at ground level nearer the fire. But my cats are always changing places, and a sleeping place might only be the favourite for a month or so. Stretch Out, Tiger the Tortoiseshell! Sometimes it obviously feels nice to squash onto one chair, like brother and sister cats Percy and Histeria the tabby. Or maybe a long stretch out on the carpet in front of the log-burner - as long as the dog isn't around to tread on anything sensitive. But the hardier cats still come outside gardening, and new cat-in-garden pictures pop up here and there in my journals. 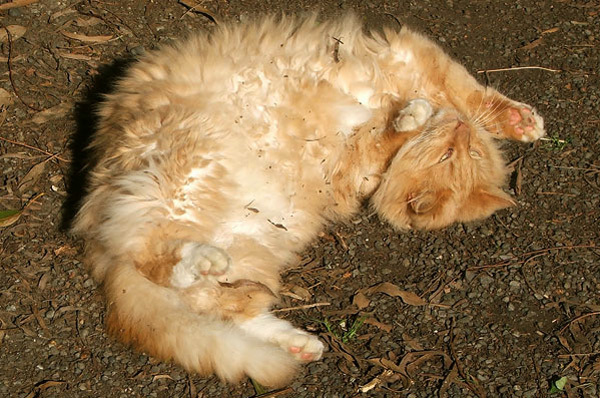 Some of my winter days are crisp and sunny, so cats are often to be found indiscreetly exposing their tummies. This must feel really nice if the belly is fat and furry - doesn't it, Fluff-Fluff? Active gardening cats should get the most credit, though. It's one thing to lie with your legs in the air and relax, but staying on the move and keeping up with the Head Gardener's wheelbarrow is much more important. So is the concept of being ornamental in the garden, and providing colour on a slightly drab winter's day. Thanks, particularly to Percy, whose vibrant ginger stripes brighten up many a dull border. It's nice for a Moosey cat to surprise the gardener, particularly when you choose to live in the Stables and lead a rather random life. Hello, Lilli-Puss! She's an outdoors-only cat, but loves providing cat-company when I'm gardening. 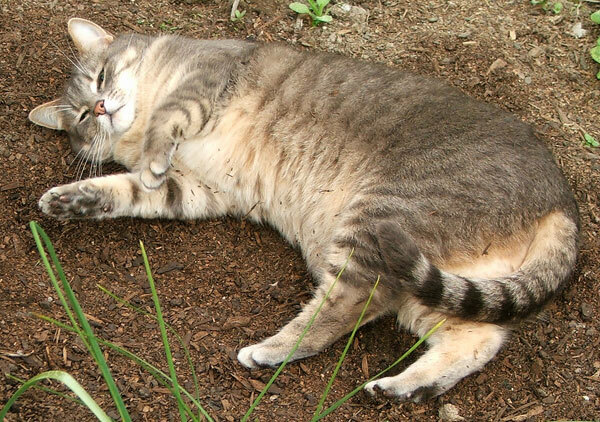 Then occasionally I get the absolute best from a cat - the tummy pose, the personality and cat-company, great gardening focus, faithful following, and true friendship. Thanks, young Minimus! Some of these cat photographs have already appeared in my journal pages. Allow me to present them again here.